The biggest collection of toys outside Santa's workshop is in New York this week. Some 1,500 manufacturers from 30 countries are showing off the new toys your kids will want in coming months. The four-day fun fest runs through Wednesday. 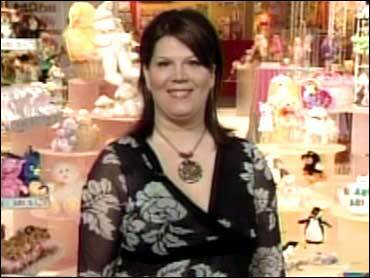 Marianne Szymanski, publisher of Toy Tips and Parenting Hints magazine and founder of Toy Tips, showcased several at the fair on The Early Show Monday. Toy Tips is an independent research and consulting firm that studies toys for kids of all ages, focusing on those that stimulate developmental growth. Toy Tips has tested more than 34,000 toys and juvenile products from 900 manufacturers since its inception in 1991. This turns any boy or girl into a Spider-Man in his or her own right! The spinning web recreates spiral webs with special web fluid, and can blast water. Basically, it's like launching silly string. It's pegged to the release of Spider-Man 3 on May 4, but is available now. The web shooter is from Hasbro and retails for $24.99. It's suggested for ages 5 and older. The Air Hogs "Havoc" is a mini-helicopter that flies by remote control. You can direct it left or right, or just have it hover. It's a brand new product, available now. The "Havoc" by Spinmaster retails for $29.99. It's suggested for ages 8 and older. This is high-tech digital slot car racing. It's the most realistic kind of racing: You can change lanes, and have multiple cars on a track. Carrera is a German company, over 40 years old. And it's the world's largest slot racing company. The Digital 132 Hot Pursuit race track retails for $279.99 and is suggested for kids 8 and older. This is the very first die cast car for girls. They've played with Matchbox cars forever; now they don't have to steal from their brothers! Polly Pocket is a line for little girls, so this is an accessory to that line. And a little girl drives the car. The Polly Wheels from Mattel sells for $2.99 and is suggested for girls age 2 and older. Basically, a new Barbie doll, appropriate for younger kids, and easier to dress. Has wider comb to brush her hair, Velcro fasteners to dress her, and a stand for her to be upright. It's brand new and available now. Barbie is made by Mattel. It sell for $9.99 and is suggested for girls 3 and older. The original six ponies will be sold in one package for the 25th anniversary. Some 25 years ago, your sister had the original six ponies; now they're all coming back in a retro package. They'll be available in the fall. My Little Pony is from Hasbro.It sells for $14.99 for girls ages 3 and older. We all remember Ty's Beanie Babies, which were super popular. This is a line of six dolls, just introduced and available now. These sell for $12.99 and are for girls 6 and older. Schoenhut is over 135 years old. It manufactures very high quality wooden pianos for children. The Early Show had a 44-string grand piano (half a regular piano), sized for children. Their feet will reach the pedals; it's the only piano it's size you can find. The product is brand new, just available now. The baby grand sells for approximately $3,000. They do have smaller pianos that sell from anywhere between $45 and $200. This is pegged to the 30th anniversary of Star Wars. A Jedi makes his or her own lightsaber at the completion of training. Now, kids can play like a real Jedi master. The Lightsaber is made of very high-end plastic, so it won't break. It makes the same noises as the sabers in the movies. The Early Show had the "Force FX" sabers on set, and Szymanski had the Darth Maul saber, which is two-sided. The Lightsabers are produced by Master Replicas and sell for $119. This is less age-appropriate and more for collectors.